Xanxus is the current leader of Vongola's assassination squad, the Varia, and is Vongola IX's adopted son. He has same dying will flames as Vongola's 2nd boss had, the flames of wrath, and the same type of weapons as Vongola's 7nd boss, the dying will gun. He was able to use the flames of wrath even since he was a little child, just adding to his natural talent. Seeing this, his mother, who was mentally ill, thought that Xanxus was son of Timoteo, Vongola's current boss. After a confrontation between Xanxus's mother and Timoteo, Xanxus was adopted into Vongola family, and held precious by Timoteo, like he was his real son. Because of his almost royal status, Xanxus grew up to be egoistical, vain and cocky. These traits remained throughout all the series. Xanxus's face is seen covered with scars. 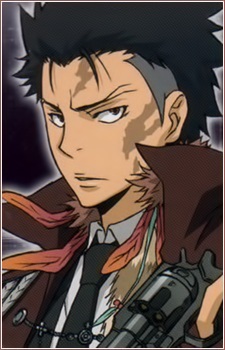 He also has spiky hair and wears the Varia uniform jacket on his shoulders. It is also adorned with feathers and raccoon tail at the nape of his neck, coming over his left shoulder to rest in the front. Top 10 Arcane Anime Guns That Will Blow You Away! Guns come in all shapes and forms, but sometimes you need a little something more than a simple bullet to deal with arcane and mystical threats against humanity. The following list will showcase magical anime guns that pack enough heat to blow away whatever is on the other end of the barrel!